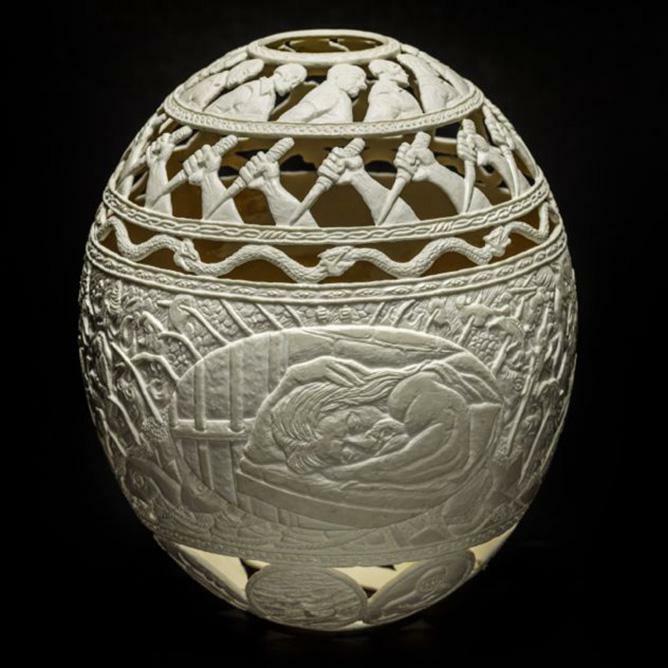 Hatched in Prison: The Art of Gil Batle is a 20-year prison diary carved into a series of ostrich eggs. 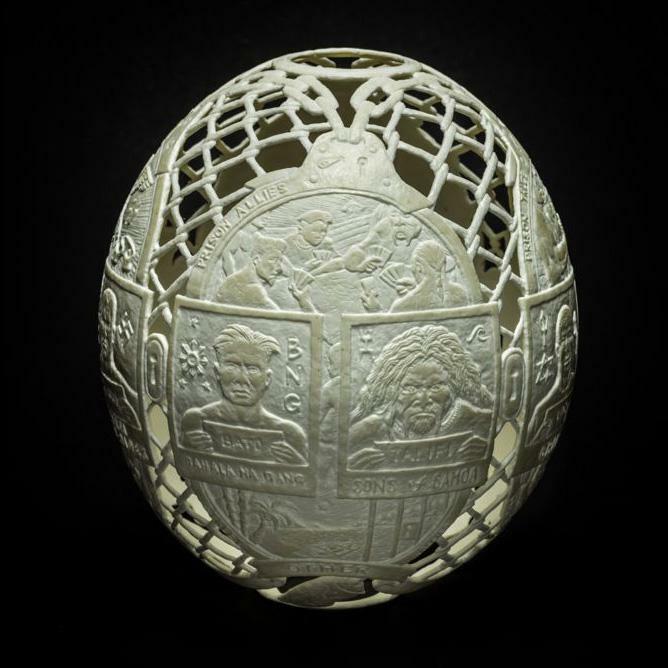 Gil Batle carved a 20-year prison diary into the surfaces of ostrich eggs. 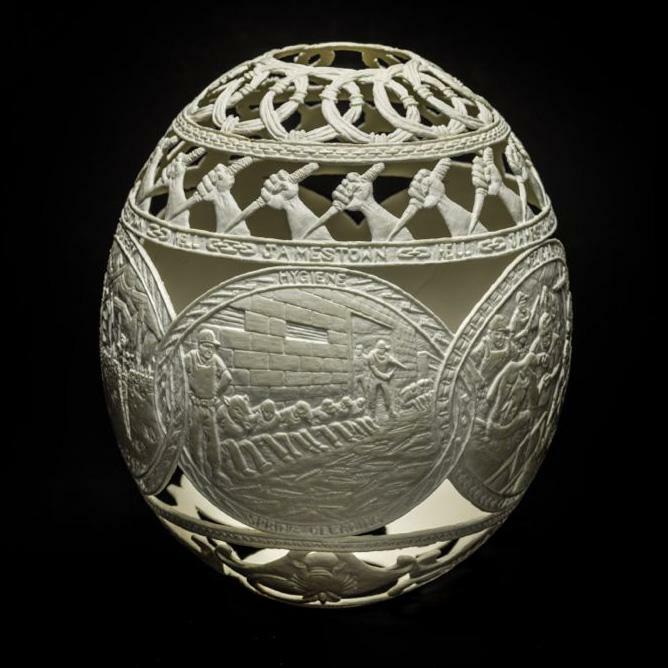 Shown here is one of a series of eggs depicting his time at California’s Jamestown State Prison, which he says was the worst of the bunch. 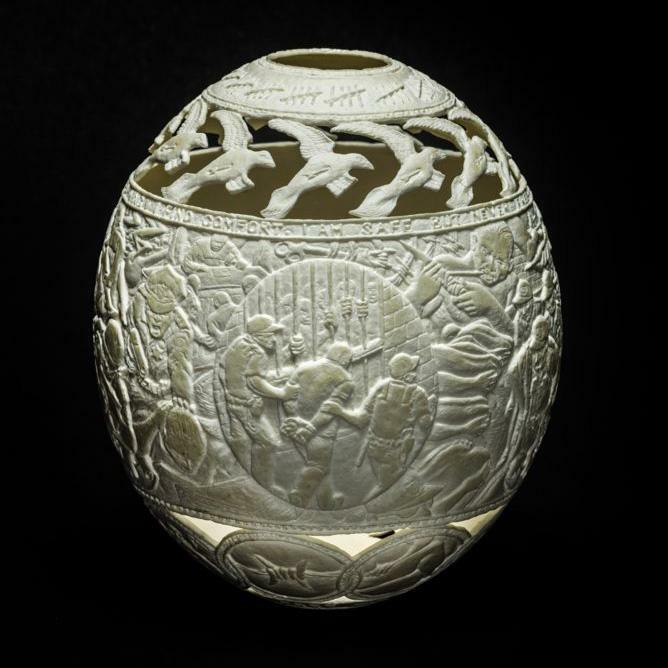 Batle carved a series of eggs depicting sleeping prisoners, who were referred to as “5150,” California police code for an involuntary psychiatric hold for people deemed a danger to themselves or others. The 53-year-old Filipino American now lives in the Philippines, where he has spent the past few years carving a 20-year prison diary into the surfaces of dozens of ostrich shells. The diary depicts his own haunting stories of prison life and those of the murderers, drug dealers, and armed robbers he served time with. “Hatched in Prison: The Art of Gil Batle” is an exhibition opening in New York City on Friday that showcases the artist’s extraordinarily meticulous work. A series of eggs titled “It’s Your Fault” depict the cycle of violence that for many of Batle’s fellow inmates started at home before continuing in prison. In prison, Batle built clandestine tattoo guns with motors from CD players or electric toothbrushes and made tattoo ink by melting chess pieces, trapping the soot in a paper bag and mixing it with shampoo or lotion. One of a series of eggs about the intake process for new inmates. These days, Batle’s medium of choice is the pristine surface of an ostrich egg shell. He selects a theme for each egg before penciling in the horizontal and vertical lines that allow him to frame out a grid for his designs, noting that perfect symmetry does not exist in a world where no egg is exactly the same as any other. From a series of eggs depicting mug shots of members of some of the racially divided gangs Batle encountered in California prisons. He then carves characters, icons, and scenes separated by images of chain-link fencing, razor wire, and handcuffs into the shells with a dentist’s drill. 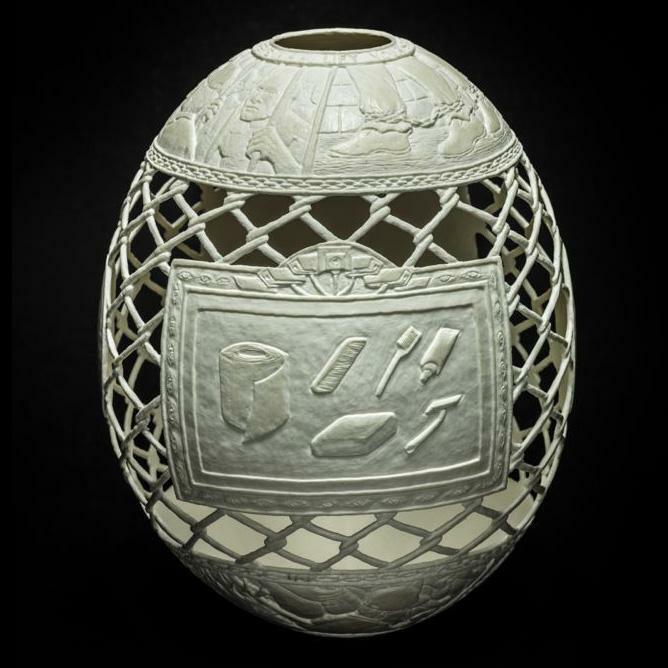 A series of eggs called “Jargon” alludes to the hidden messages that inmates and their friends and families used in written communication to avoid censorship by prison staff monitoring their correspondence. 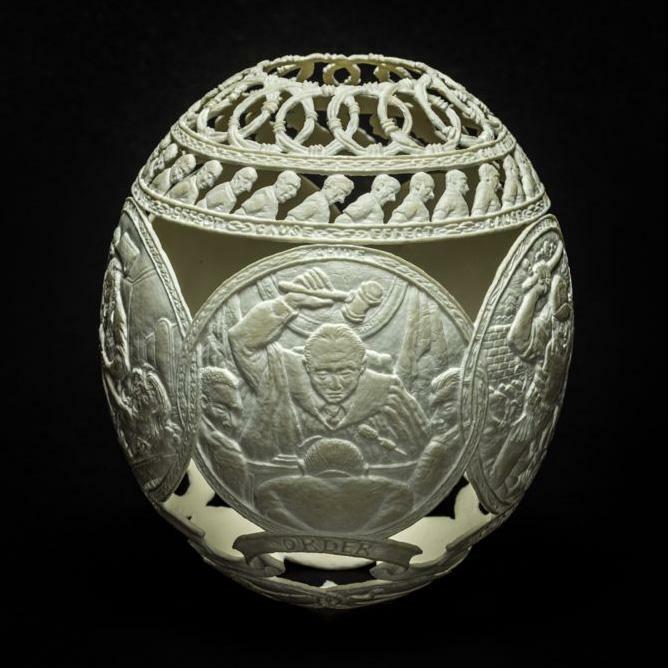 At first glance, the carved eggshells could pass for ancient artifacts until you look carefully at the subject matter: suicides and stabbings, fights and race riots, cavity searches, and other trials and tribulations of prison life. 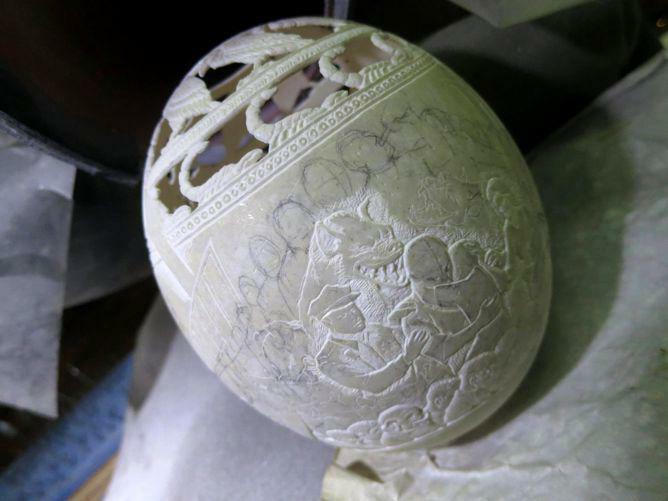 One of Batle’s ostrich egg carvings in progress. 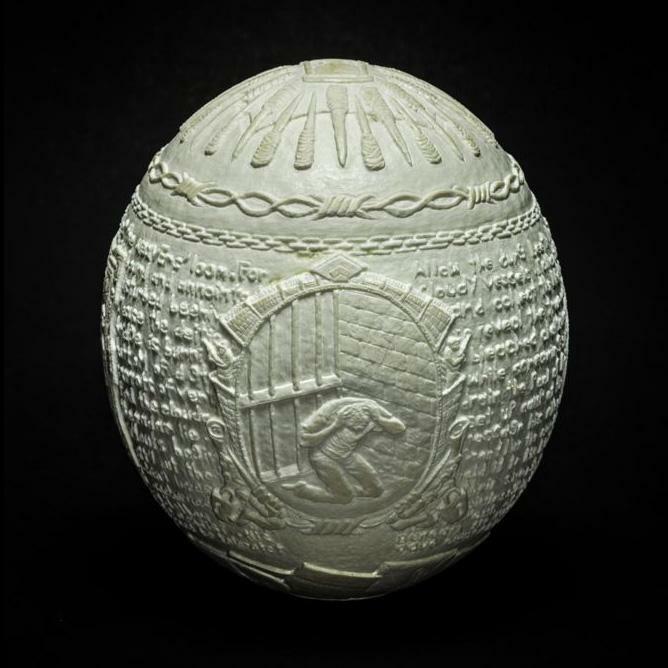 One of a series of eggs called “Sanctuary” depicts Batle’s sentiment that whether they are locked up or back on the streets, “convicts are never free” from fear, he says.